Attitudes towards the dialect of English spoken in Singapore vary from shame and contempt to pride and admiration. In these posts I’ve tried to convey an attitude of respect even while analyzing what I consider to be mistakes. 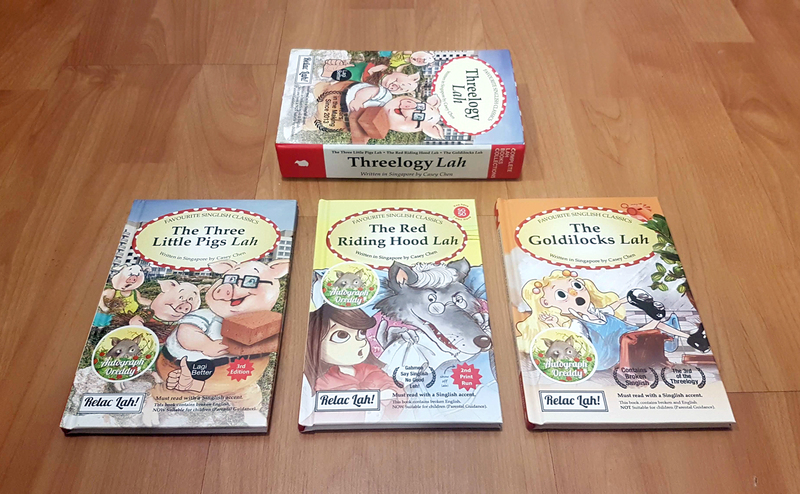 This box set contains three folk tales told in Singlish style: The Three Little Pigs Lah, The Red Riding Hood Lah, and The Goldilocks Lah. The plots are not very different from other adaptations of these familiar tales. The characters are not very different, except that the bears in the story of Goldilocks are not bears but wolves, a change presumably made to connect the third book with the first two. The setting for the stories is Singapore. The illustrations are a mix of drawings and photos of objects and places, and each book’s drawings are by a different artist. The appeal of these books (in general and for me specifically) is that they use and teach Singlish dialect and slang expressions. The target audience includes both those who want to see their own dialect used for humorous effect and those who are unfamiliar with Singlish and interested in increasing their understanding of it. See below for more details about these books. If you are looking to buy books in Singapore, this is a good place to go. It has several book shops selling new or used books. It also has print shops, art supply shops, stationery shops, and shops selling musical instruments and antiques. Within the last couple of years, these colorful square signs were added to convey the complex’s status as a cultural hub of sorts. One of my pet peeves is lists of things that aren’t all the same part of speech. “Art, Dance, Explore, Sports, Book” is a fantastic example. See below for why. Last June, I posted a photo of a sign that said “Cutleries Station”. They have improved the sign tremendously since then. 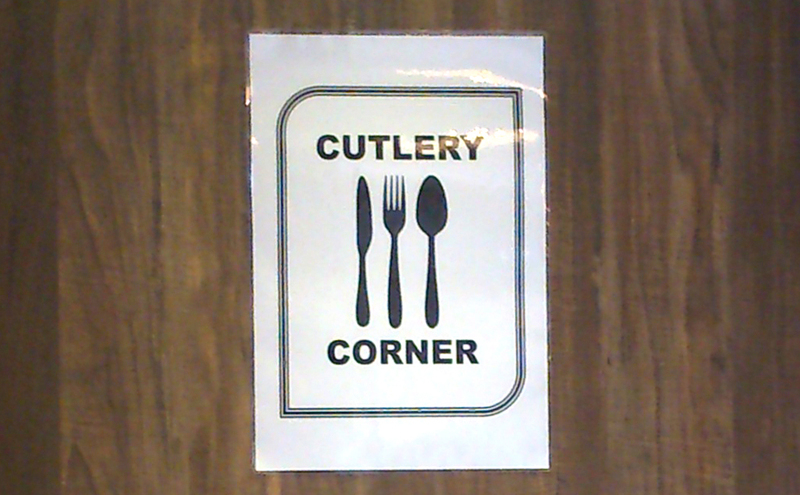 In particular, the non-word “cutleries” has been replaced with “cutlery”. The sign has an icon showing cutlery, for additional clarity. The sign is in better shape. It uses cheesy alliteration (of which I am a fan). I didn’t mention it before, but if you say “cutleries station” aloud, it runs together because of the “s” in the middle and sounds like “cutlery station”. Maybe the similarity in the pronunciation of the two phrases helps explain why the previous sign was written the way it was. The inaudibility of that double s also helps explain “Today Special“. I can’t look at the URL printed on this bag and not think of the “salt and battery” (assault and battery) couples costume concept, which relies on the two meanings of “battery”. It’s kind of a tasteless pun, despite the salt! Continue reading “Battery”: countable or uncountable? Zero-inflection plurals do not include cucumber. Rich in nutrients, Cucumber are excellent in salads, sandwiches, stir-fry and sushi. Here, the fact that the singular is being treated like a plural makes it sound as if cucumbers are exotic animals like bison or buffalo. Recently, though I don’t have a photo, I saw a sign in front of some model planes (in the Tin Tin shop strangely located on Pagoda St in Chinatown) that was advertising “aircrafts for sale”. Ack. No. For a variety of historical reasons, English has many kinds of nouns that are annoyingly difficult to pluralize, and Wikipedia helpfully lists them. Interestingly, the cucumber package shows ‘salads’, ‘sandwiches’, ‘stir-fry’, and ‘sushi’ all in the correct form, even though ‘salad’ requires an ‘s’, ‘sandwich’ requires ‘es’, and ‘stir-fry’ and ‘sushi’ are uncountable. Why, then, was it so hard to give ‘cucumber’ its plural ‘s’? And why is it capitalized?! When my husband took me to a squinchy Japanese restaurant that had high chairs at a bar-style counter, the server laconically instructed me to put my bag “downstairs”, which meant “on the shelf under the seat of the chair”. I have heard English teachers eager to hold students accountable for their spoken language deride this common Singlish use of “downstairs”, but it’s wonderful (and typical) in its succinctness. If you use the preposition “under”, you have to include a noun for the preposition to be, well, positioned in front of. If you use the adverb “downstairs”, you’re just saying something needs to go below something else, and letting context do the work of indicating what the something else is. Chinese has a phrase approximately meaning “down side” which can be used the way the server was using “downstairs” to adverbially indicate “under something”. It also has phrases meaning “up side”, “behind side”, “opposite side”, etc., and you can say “located opposite side” without needing to say “located opposite the hotel”, for example, the way we can say in English that “the receipt is in the bag” or just “the receipt is inside”. I get the sense that Chinese relies on context more than English, or at least relies on context in ways that English doesn’t, since a large proportion communication in any language is always shared context. The idea for this jokey name is that the word “west” in Singlish has the exact same three sounds as the word “where’s” in Singlish. Yep. They’re both pronounced “wes”. Below is some explanation of what the advertisement wants you to do (spend money, duh) and how the math works. There are none so blind as those who will not see plural nouns.